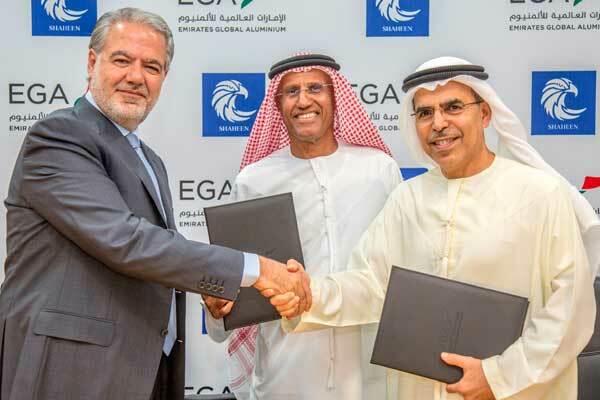 Emirates Global Aluminium (EGA), a major industrial company in the UAE, has signed a long term supply agreement with Shaheen Chem Investments which paves the way for the construction by Shaheen of a chemical complex in Khalifa Industrial Zone Abu Dhabi. Once it starts production early next decade, Shaheen’s ethylene dichloride and caustic soda plant will supply all its caustic soda output to EGA’s Al Taweelah alumina refinery for a period of 15 years, said a statement. This will entirely meet EGA’s needs for this raw material, it said. Construction of the plant will significantly boost the UAE’s production of caustic soda, an important raw material in industries from petroleum products to chemicals manufacturing as well as alumina refining. The new plant will be the first in the UAE to produce ethylene dichloride, which will be sold to third parties, it added. Ethylene dichloride and caustic soda manufacturing is a new industry for Kizad and construction of the plant is expected to boost Kizad’s role as an industrial centre for Abu Dhabi and the UAE. The long term supply agreement was signed by Abdulla Kalban, managing director and chief executive officer of EGA, Shaheen’s chairman Rashed Al Suwaidi and Shaheen’s managing director Walid Azhari. The signing was witnessed by Abdelkareem Al Masabi, executive vice president - Ports of Abu Dhabi Ports which is the master developer and operator of Khalifa Industrial Zone Abu Dhabi. “I am pleased that our company’s demand for caustic soda is creating further industrial expansion in Abu Dhabi, continuing EGA’s long-standing contribution to the diversification of our economy as we grow our own business,” he added. The new plant will be built near to EGA’s Al Taweelah site on a 300,000-sq-m plot and has room for future expansion. The production capacity of the first phase of the plant is expected to be 130,000 tonnes per year of caustic soda and 160,000 tonnes per year of ethylene dichloride. Shaheen envisages a later second phase of the project, which will double caustic soda production capacity and begin production of vinyl chloride and polyvinyl chloride. The UAE currently imports all its polyvinyl chloride needs. Local production could spur the development of manufacturers using polyvinyl chloride at Kizad.